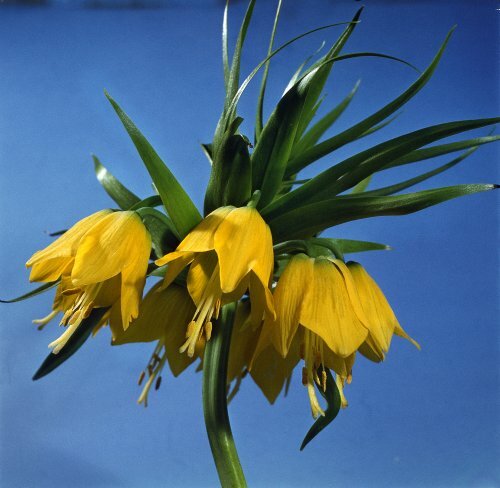 This genus was split from the genus Fritillaria mainly on the basis of its bulb structure, and the species are retained in Fritillaria by many botanists. There are 2 species in the FSU. P. eduardii (Regel) Vved. 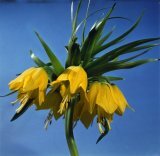 (Fritillaria eduardii Regel). Central Asia (Pamiro Alay). In subalpine meadows, in grassy places on slopes. Bulb 6-8 (-10) cm diam. Stem leafy 50-120 (-140) cm. Leaves in whorls, lanceolate, 12-24 cm x 5-9 cm, bright green, numerous (35-50). Bracts numerous, above the flowers. Flowers 5-20, in crowded umbel-like inflorescsnce, broadly bell-shaped, orange, dark yellow, carmine-red, large, 6 cm long. V - early spring to mid summer, in St. Petersburg April-July. Fl - April, May. Fr - June-July. P - by division (daughter bulbs) and by seed, flowers in 5-6 years after sowing. Requires full sun and well-drained soil. Very attractive. Well suited for flower beds. Z 4. New. Central Asia (Kopet-Dag) and northwestern Iran. Rocky screes, stony slopes, often among shrubs. Stems 50-70 (-100) cm. Bulb broadly ovate, 6 cm diam. Leaves numerous, alternate or in whorls on lower or middle parts of shoot. Leaves nearly 10 cm long, 3.5 cm broad. Flowers pale yellow, sometimes greenish, 5 cm diam. Perianth broadly campanulate. Flowers 3-6 (12) in umbel-like inflorescence. V - April to July. Fl - April-May. Fr - June-July. P - by daughter bulbs and seed. Prefers sunny locations and well-drained soil. Z 4.